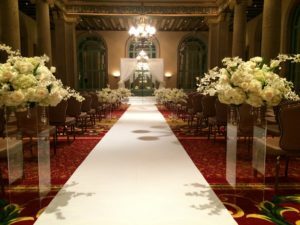 Wedding Officiant Annemarie Juhlian Isn't Crazy About A Wedding Aisle Runner! There are many decorative elements I LOVE for a wedding ceremony. Gorgeous décor at the front of a ceremony space to frame a couple. Beautiful candles in appropriate places. Excellent lighting. An ceremony aisle that is wide enough. AND there is one thing I’m absolutely NOT crazy about at a wedding. Over the years, I have witnessed mishap after mishap with an aisle runner. You see, a happy engaged couple looks at beautiful “before photos” of a runner, loves the look and decides to incorporate it. This goes for a runner that may be indoors and outdoors. I know, who would put an aisle runner on rough ground, slippery grass or even on hot cement? You’d be surprised. An outdoor runner isn’t good and oftentimes is worse than an indoor runner. So, personal taste always wins and coming from this side of the wedding aisle, I vote a ‘no go’ on a wedding runner. Instead, line the aisle with pretty petals. This is so gorgeous. Stay away from aisle lining the lit candles (even in protectors). Candle elements get hit by people walking down the aisle and it always make me nervous to watch a lovely bride process down the aisle, with her gown swishing back and forth, surrounded by fire.